The procedure used in the chapters of the book is called an axiomatic procedure in mathematics. Hypotheses are drawn from the analysis of empirical data of the Kepler satellite, which are called approaches and axioms. The statements derived from this are formulated as sentences to which certain probabilities are assigned. All axioms and sentences lead to an overall representation of the situation, which can then be used as a working hypothesis. This is a working hypothesis regarding the distribution of habitable, earth-like planets, as well as life, intelligence and civilizations in our galaxy. It is rather improbable that we are alone in the universe. It is more probable that we are not alone. The book is based on the mathematical part of the "Alien Hypothesis". 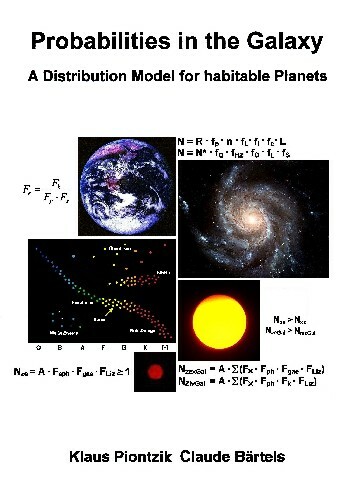 The work "Probabilities in the Galaxy" forms a closed, uniform working hypothesis that describes the distribution of habitable planets, life, intelligence and civilization in our galaxy. Furthermore, the Drake-equation and the Seager- equation have been integrated into the model. In order to make the model of the distribution of life and intelligence in the galaxy accessible to a wider public, we have decided to put the mathematical part of the model largely on the Internet. As much of the model is published as necessary to implement the model. However, the references in the text can only be looked up in the book.